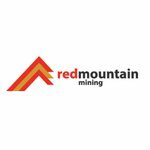 Red Mountain Mining (ASX: RMX) has well and truly left its gold exploration past behind, and has just taken first dibs on the Red Valley Project, a lithium brine project in Western Utah, USA. The Red Valley project is said to have remarkable resemblance to Nevada’s Clayton Valley where the $8.5BN Albemarle’s Silver Peak mine is located. Albemarle Corporation (NYSE: ALB) is currently the only North American lithium brine producer and has been in production for 50 years and counting. So there is certainly room for another player, and RMX through its Red Valley Project is angling to hopefully define the USA’s second conventional, long life, lithium brine production province. RMX is well funded for exploration at Red Valley and has a new board committed to prudently managing costs. To go on top of the $1.68M recently raised, RMX has also just completed a $350,000 Share Purchase Plan, all of which will fund drilling, identify new opportunities and provide general working capital. Given RMX’s market cap is currently less than $4.5M, the company’s enterprise value is quite small given the potential upside here. The company’s cash position has also enabled it to recruit a sage of the Utah brine flats into its ranks, in pursuit of one of the most intriguing brine deposits of the entire Clayton Valley — the equivalent of a lithium brine mother-load. Is Red Valley a geologic analogue to Clayton Valley? RMX is hoping to answer that question sooner rather than later. With its change in focus, and its highly strategic location (the US is one of only three regions in the world that produce lithium brine), the company has certainly put itself in a good position to do so. Although it should be noted that this is a very early stage play and investors considering RMX for their portfolio should take a cautious approach and seek professional financial advice. Location is important for RMX for several reasons. 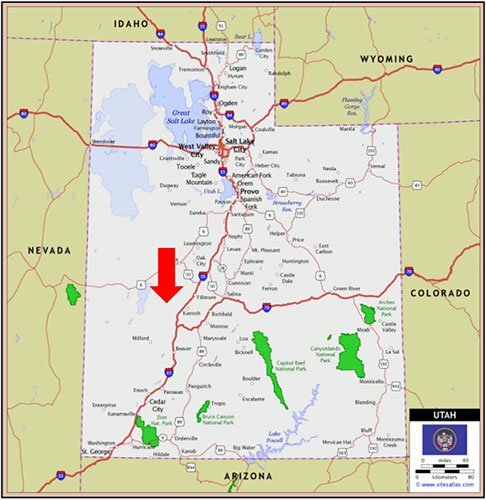 Not only has RMX snagged a neat package for a quick entry into Utah, but it has picked a specific area identified by renowned lithium brine bloodhound William Feyerabend, a cornerstone lithium guru with an acquired taste for North American brine. According to Feyerabend — a certified professional geologist with local Clayton Valley experience going back to the mid-1960s – the Utah area “closely resembles the known lithium-rich Clayton Valley in Nevada in several key categories that raise the probability of striking a significant hit upon first drilling of the tenement package in Q4 2016/Q1 2017”. As regular readers will also know, Utah isn’t too far from the current lithium-ion battery commercialisation-fest raging on in the mid-West of the United States. Utah is typically synonymous with oil exploration, and that’s exactly how several lithium deposits were first discovered. 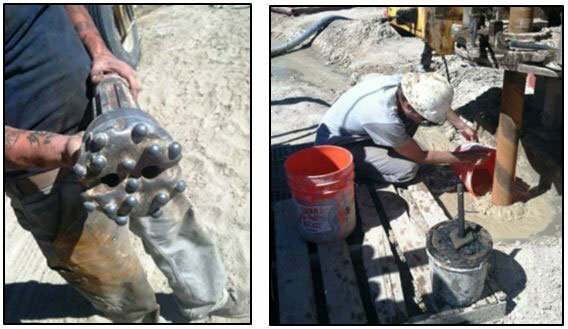 Lithium-bearing brine was discovered in the 1960s when over pressurized oil exploration wells encountered blowouts upon drilling. 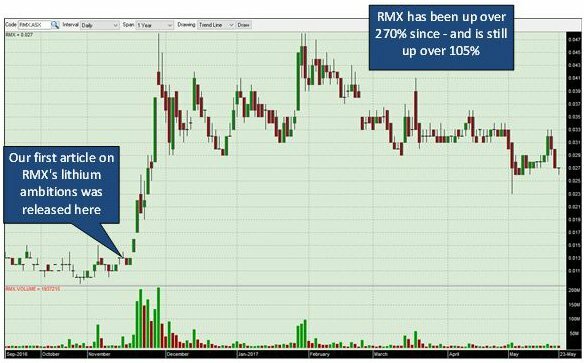 ...while RMX turns over a new leaf and darts into a relatively undervalued lithium asset in a location rich in lithium grade, but poor on public awareness of its full potential. Red Mountain Mining (ASX: RMX) has penned a Heads of Agreement with North American Lithium, where it will fund initial drilling and chemical analysis of a newly identified Lithium Project in Western Utah, USA. The plan is to obtain first sample results testing for lithium enrichment as soon as possible. If RMX is happy with the grade, it can acquire 51% of the project for a paltry $250,000. Essentially, RMX has entered into a progressive joint-venture agreement where it will spend approximately $500,000 in total, to buy into 51% of the most geologically similar area of known lithium mineralisation to Clayton Valley, than anywhere else. ...which could have a great chance of raising its valuation and silencing its critics in one fell swoop. Particularly when you consider that RMX has recently successfully raised $1.68M in a sophisticated investor placement and just closed off an oversubscribed SPP of $350k. 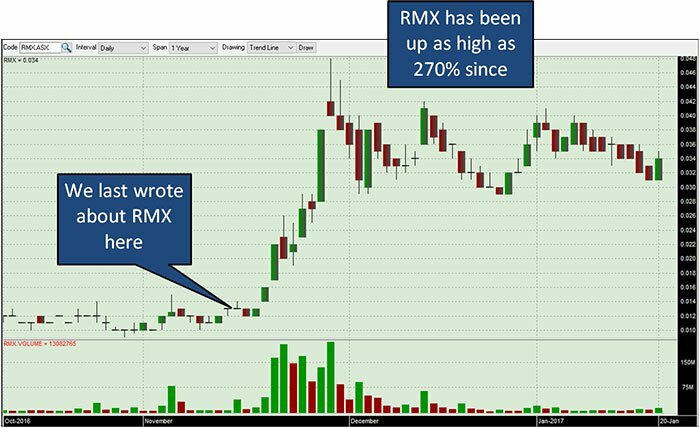 RMX was previously a gold explorer, and was making slow-but-steady progress at its Batangas Gold Project in the Philippines. However after a board overthrow and share consolidation, RMX is moving on and taking decisive action to switch focus to this low opex metals option in Utah, with potentially very high capital acquisition once this “new energy metal” starts flowing to buyers. Putting its unfortunate past behind, RMX is moving forward to try to remediate its metals exploration status as soon as possible. The Clayton Valley spans approximately 100km 2 , but has a catchment area of approximately 1,400km 2 . That’s because the Clayton Valley sits lower than more than half a dozen adjacent basins, all of which are hydrologically linked. In other words, Clayton Valley is the final destination for this lithium delta — or in hope of RMX in Utah, the bottom floor of a similar lithium champagne tower once lithium sales get going on a global scale. Take a look at these features of Clayton Valley, and then we’ll take a look what RMX has identified in Western Utah. 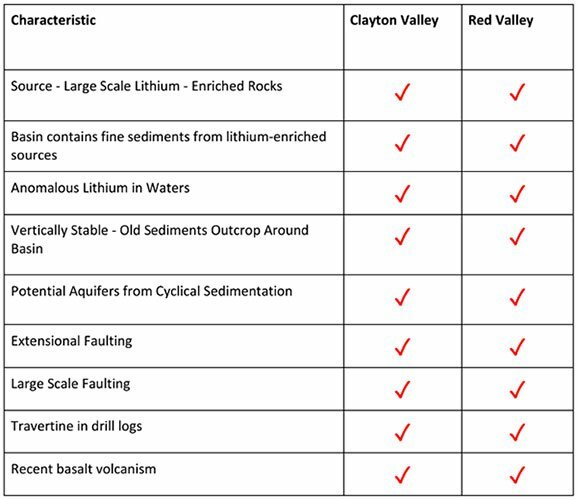 The Clayton Valley is known for containing several high-grade bulky lithium deposits, with known contributory factors playing key roles in determining how lithium-rich a particular area is. This means there is a high chance of lithium-bearing rocks containing rich grades of lithium. In the same sense that lithium is concentrated in late crystallizing rocks because it does not fit easily into common mineral crystals, it also is easily flushed out of those crystals during weathering because it does not fit in so well. Once freed, lithium ions either flow downhill dissolved in water or attach to clay particles (which can carry 100 – 1,000 ppm Li) and are carried downhill in water runoff. Ultimately, those lithium ions end up finding a resting place where there is nowhere else to go — such as a valley. In Clayton Valley’s case, it is possible to accurately measure weather and soil erosion data and compare it William Feyerabend’s chosen location in Red Valley. The clear comparison reveals several close correlations, which if proven true, could mean RMX one day getting its hands on a resource rivalling the $8.5BN Albemarle in Clayton Valley. ...but if there is lithium mineralisation here, RMX could finally recoil like the loaded spring it always was. It just depends on the first drill results, which should be forthcoming before the end of the year. A neat catalyst for Christmas perhaps? Of course, any share price appreciation is speculation on our part and therefore investors should only use the information in this article as part of their overall research into the company and not invest based on this information alone. Could Nature’s lithium depository in Utah serve up the grade required? Weather patterns and soil erosion are one aspect, but actual geology and geography play the other part. RMX’s Utah asset has extremely favourable magmatic factors in its favour. This is how nature ‘makes’ lithium — circulating systems of hot water leach lithium from tonnes of lithium-enriched rocks and move it to a final ‘repository’ at the surface – ready for RMX to hopefully find it. Sedimentary patterns presented by William Feyerabend indicate further synchronicities in terms of water well sedimentation readings. As you can see in the image below, further water chemistry analysis has been conducted which adds to the case that RMX’s new-found Utah asset is geologically analogous to Clayton Valley, and could therefore be packing similar bumper brine deposits. All in all, RMX thinks it has first dibs on a supremely high potential lithium asset. The table above brings us back to modus operandi at this stage of proceedings. As it stands, RMX has entered into an exploration and earn-in agreement and hopes to analyse its first samples in order to decide whether to pull the trigger on acquiring a majority stake in the project, and possibly applying for more land tenure. Seeing as Red Valley has fallen into RMX’s hands, it is understandably coy to let it slip away and attract unwanted competition for this prize. But there has been significant corporate activity in the broad vicinity of Utah — clearly the whiff of Utah’s lithium has not gone unnoticed; but for how much longer? To be followed up soon after by news of Uranium Resources going down the same route in acquiring a viable lithium brine asset in Utah. RMX’s new venture, led by William Feyerabend is a straight-forward swing for an appreciating commodity based on nearly identical geology, water chemistry and soil analyses. It should be noted here that commodity prices do fluctuate and can go down, and lithium is no different. Investors should keep this in mind and seek professional financial advice if considering this stock for their portfolio. ...and this will be going ahead within the coming months following the completion of RMX’s recent fund raisings. The first work program has been estimated to cost around US$450,000 as proof of concept work consisting of 2 phases, $320,000 and $120,000. Furthermore, there is optionality to expand its stake in the area, but of course a lot will depend on first drill results. The total cost of initial drilling, analysis and tenement applications is estimated to be between US$200,000 and US$325,000. If commercial grade Lithium is reported in brines, RMX has the right to acquire 51% of the Project for US$250,000. ...but by the same token, has room for a quick up-scale if things work out as hoped. Most of the world’s lithium is currently produced in Australia, Chile and Argentina, but more recently, there’s been a veritable lithium rush in Nevada. Since Tesla’s Elon Musk announced that it would build its gigantic lithium-ion battery gigafactory in Nevada, junior mining companies have been flocking to Nevada to try their hand at developing lithium projects. 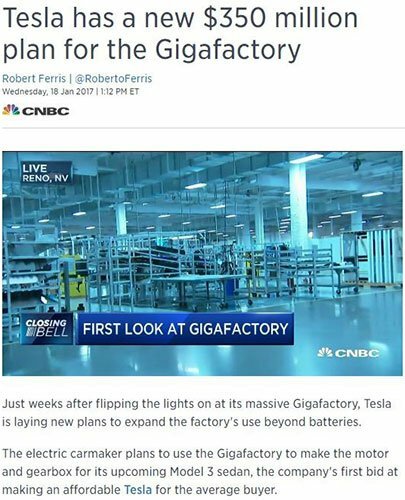 The gigafactory opened at the end of July 2016, and interest in the lithium space continues to grow, much of it focused in the Clayton Valley. Seeing an eye for an opportunity, one 40+ year geologist has discovered eerie similarities between Nevada’s Clayton Valley and a particular place in Western Utah; a place with similar valley river systems, geology and water chemistry. If William Feyereband is correct, RMX is backing the right horse in the gallop for lithium resources and eventual offtake agreements close to point of sale. As with any Resources exploration there are inherent risks and probabilities of success fluctuating under conditions not in an explorer’s control. RMX still has a mountain to climb before it gets a viable project off the ground and into the commercial savannah of jousting with lithium-starved battery manufacturers, but at least now, it has closed the door on dale-digging and moving firmly into digging for tomorrow’s gold.